I am lucky enough to browse images of a wide variety of artworks as part of my daily work at the PCF, which also involves attempting to ensure that our database of nearly 40,000 artists is as up-to-date and accurate as possible. Inevitably, there will always be ambiguities that are too obscure to correct through using the usual source material, such as the Getty Union List of Artist Names, or David Buckman's or Christopher Wright’s reference works. Luckily for the PCF, however, we now have the Art Detectives to call upon if an artist’s records are particularly elusive or confusing. 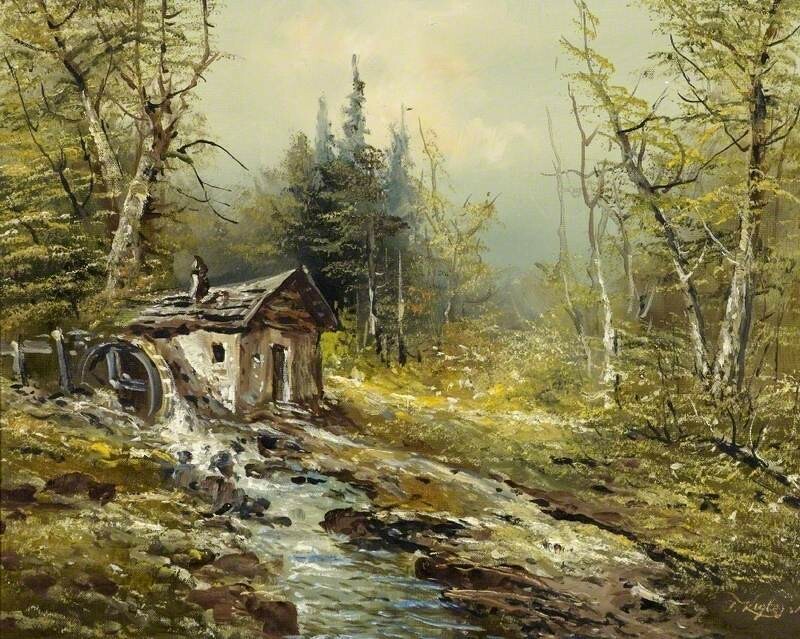 I wanted to find more about Josef Kugler, the artist of a few rustic woodland scenes held at the Russell-Cotes Art Gallery & Museum. PCF listed the artist as ‘active 1911–1926’: I found a Josef Kugler was born in 1913, a ‘forest, Alpine, coastal and landscape’ painter. However, I found there is more than one artist of this name, including a father and son. A Josef Kugler died on 17th October 2011 but we couldn't be sure it was the same artist. Surely the surname was unusual enough to assist in searches for more information. Tim Williams soon was able to clarify matters, having noticed the signatures on the artworks say ‘Sen’ or ‘Sr’ after the name. Josef Kugler who died in 2011 is the same Josef Kugler born in Vienna in 1913. Documentation accompanying some of the artist’s paintings are accompanied by text indicating the artist studied at the Academy of Fine Arts in Vienna, and lived in Linz, Munich and Paris, and that Kugler was regarded as a premier landscape painter in Vienna: ‘many publishers in Europe and the US sought to publish and distribute reproductions of his artwork’. Though Tim adds that the artist seems more to be a decorative furnishing painter. As Andrew Greg indicated, however, in the meantime there is still the matter of Josef Kugler’s artwork’s titles. What is a ‘Waxted’ landscape? Is this a misreading of ‘wooded’? Any suggestions, please propose a new discussion on the individual artwork page. Which Josef Kugler painted 'Waxted Landscape Mill Wheel'?